Is it possible to lose weight with the squats? Squats - one of the basic exercises not only in the morning exercises, but in bodybuilding, powerlifting, as well as in the training of athletes. When performing a squat involves the quadriceps muscle of thigh, gluteal and calf muscles. This exercise at first glance quite simple: you need to sit down and then stand up, returning to standing. However, it is important to do squats correctly. There are multiple variations of squats, including with the use of dumbbells or barbells to increase the effectiveness of squats. Depending on different ways to do squats, the emphasis is on different muscle groups. For example, squats on both legs works the muscles of the thigh; squat on the toes to activate the work of the calf muscles; squats on one leg alternately strengthen the muscles of the buttocks. Stand straight, feet shoulder width apart. Hands to dissolve in hand or keep on the belt. Back keep straight. Reducing stomach muscles, bend your knees, resting on the whole foot. In time with the squats hands can be pulled in front of you, or get them for the back of the head, or raise them on the sides along the body. Slowly return to the starting standing position and repeat the squats. This exercise strengthens the thigh muscles and calf. Starting position similar to the first embodiment. The only difference is that in this exercise with squat, we focus not on the whole foot, but only on toes. This way of squats will involve your calf muscles. Another version of squats. Stand with legs at shoulder width, knees out. Hands can be put on belt or dissolve them in the parties. From this initial position are performed squats. At the same time, the deeper you perform squats, the better. This kind of sit-UPS strengthens the muscles of the inner thigh. The main objective of the exercise to squats to increase your strength, health and well-being. It is important not to give the descent of his laziness and to persevere, persistence in achieving goals. Exercises on squat protivoparaz when problems with the spine, as in this case, it especially enhanced the unwanted load. Also these exercises are not recommended for pain in the joints or knees. The correct technique of performing sit-UPS is very important. To avoid injury to the back must be kept straight and not bent. To avoid excessive load on the knee joint when doing squats do not lower your buttocks below the knee level. To lose weight, keep fit or just to feel good, you need to involve more muscles. Not all exercises work in a complex, mostly they are directed to some one part of the body. But the benefits of squats are obvious not only for legs but for other muscles. Any physical activity is good in moderation. Improper execution of exercise or excessive zeal in the classroom can lead to the opposite result. So that you are squats, if you perform them wisely. First, the effect of sit-UPS is expressed in the active growth of muscle mass on the buttocks, thighs and hips. Any other exercise to achieve quick results for these parts of the body. Second, if during squats a little wider to place his feet, and socks to deploy out, then activated the inner thighs. This is the most "capricious" area of the female body, which is very difficult to tighten. Thirdly, the use of sit-UPS that this type of physical exercise the body if used, it is much longer than, for example, the bench press. Moreover, plie squats and deep cover not only all the muscles of the legs and buttocks, but also oblique and straight press. Often this exercise is performed with weights – barbell on shoulders or dumbbells in hands. Therefore, squatting, you can strengthen these areas. Those who are interested in that give squats will be pleased to know that one of this exercise you can replace a few others. The positive effect of sit-UPS has long been known to professional bodybuilders. These exercises stimulate the production of the hormone testosterone, which is responsible for muscle mass growth. Thus, squats, Cycling the greatest number of muscles are conducive to the hard training of the body as a whole. No matter how effective they may be, the harm from squats too. If you perform the exercise incorrectly, for example, to calculate the forces and to take too much weight can lead to disc herniation. Squats with weights, you can't execute teenagers, as they can stay in growth. Deep plie with splayed toes often lead to the dislocation of the knees and ankle joints. So squat with a weight you can only after a full medical examination. And then you have to regularly pay a visit to the doctor, who will monitor the changes in the body. In addition, we must remember that excessive zeal in squats may be fatigue and exhaustion that will lead to inability to continue classes. It is therefore necessary to train according to the best of their ability, increasing the load gradually. The squat is one of the basic exercises in fitness. Depending on the technique of sit-UPS during exercise involves the muscles of the buttocks, the quadriceps, to a lesser extent, calf muscles, as well as all the small muscles of the lower body, in addition, involved back and press. Experienced athletes know how to regulate the work of certain muscle groups during sit-UPS to provide the desired load at the desired part of the body. 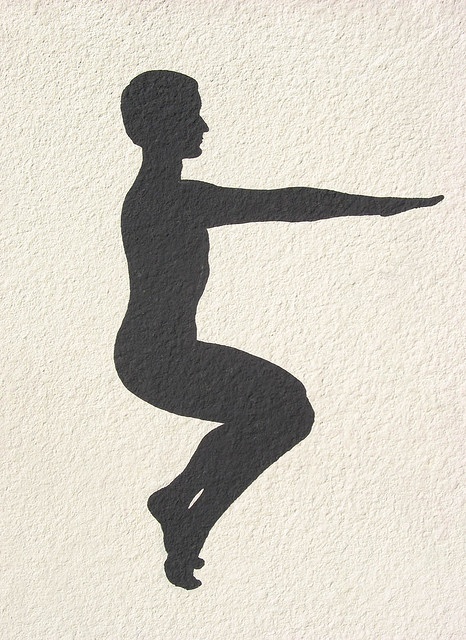 Squat – an exercise in which the man lowers his torso down by bending the knees. There are many variations of sit-UPS in which different muscles are utilized in varying degrees. Select the right exercise depending on your goals and sport: for example, there are powerlifters squats is the most deep and heavy, they provide the greatest load on the muscles. Use squats bodybuilders, fitness enthusiasts, weight lifters, this exercise is even included in the basic set of exercises which is often done in physical education classes in kindergartens, schools and other educational institutions, sports sections. Squats have on the body a whole range of different effects: they increase the blood circulation in the pelvic area, which stimulates faster metabolism and helps to get rid of cellulite; they burn huge amount of calories; they contribute to the formation of a beautiful posture; and most important – they strengthen the muscles, thereby making people stronger, fitter, more mobile, with the relief of the lower part of the body becomes clearer and more expressive. Most while classic sit-UPS, when the buttocks are pushed back, back straight, feet are parallel and your heels not leave the ground, working the quads is a large muscle on the front of the legs and gluteal muscles. If a little dilute socks in the side and the back tilted forward (not rounding), you can increase the load on the buttocks. The wider the legs are divorced, the less involved the outer thigh muscles, located on either side from the outside, and more are included quads. Wide squats with divorced socks legs – plie – work inner thigh. Shallow squats without additional weight other small leg muscles, including the gastrocnemius, are utilized to a lesser extent. The deeper squat and more weight, the harder it is to squat and the more load on the calves. Also, if squats works the back, even if no additional weight have to keep your posture straight, causing the back muscles to strain and become stronger. The press is also activated during exercise, although only slightly. The deeper squats and more weight, the stronger grow muscles – it helps to create the desired topography. More intense, but less severe and shallow squats increase muscle endurance, strengthen them, but do not contribute to their increase. Squats — a basic athletic skill, in which worked a group of muscles — the quadriceps, thigh adductor, soleus and more. Exercise is one of the three competition powerlifting squats. Also in your workouts, include squats the athletes involved in bodybuilding, weightlifting, athletics, swimming, hockey and other sports. Rod, platform, shoes with hard soles, a fixing belt, an experienced friend. Before you begin to perform this exercise, go through the instructions of a trainer or more experienced athlete. The risk of injury if improperly performed sit-UPS is great. You can break the hand, to pinch the spine or to other damage, which will take you out of action for a long time. Go very carefully to the theoretical training. Immediately before exercise, warm them up, prepare the legs and back to work. If there is no experience with squats, start to hone technique with a wooden pole, which mimics the shape of the Griffon. After you squat more confident, not breaking the equipment, move on to squats with the Olympic vulture (20 kg). Understanding the proper technique of sit-UPS within one or two workouts, gradually increase the weight of the projectile. A healthy man needs to overcome in the squat a barbell weighing equal to its own. Start your workout with light weight. Take a barbell weighing 50% of your max. Make a start of 8 repetitions. Gradually increase the weight and decrease the reps. If, having mastered the proper technique, you can not sit with a weight comparable to your own weight, exercise will temporarily aside and take care of General physical training — Jogging, swimming, jumps out of a low squat. Gradually improve your results. At first the growth of your strength will be impressive. Muscles involved in squats, have a lot of potential. In 1-2 years, depending on the chosen program and the availability of a skilled trainer, you can double the weights in the squats. If you continue to do efficiently and with a clear objective, squats 200 kg will not be something supernatural. In addition to proper technique, pay attention to the recovery of the body, nutrition for special treatment and many other details that will help you become a high level athlete. Regular sit-UPS will allow you to gain muscle mass and become stronger, but also generally strengthen the entire body, allowing you to avoid old age problems with the spine and joints. If your goal is health, not athletic performance, do not overdo the exercises with very heavy weight. With many years of very hard training you can achieve a negative effect for the body. So as not to injure the ligament, use shoes with a solid sole with a small heel. Don't squat in running shoes with a soft sole. It is very important to bend the back at the moment of squats. Otherwise you can get injured lumbar.